You’ve been turning for a little while, you like to turn, and most of your projects, those that avoided the fireplace, have been polished up and given to friends and relatives. Joe has paid you a visit and the discussion turns to your hobby. “Here Joe, is the bowl I turned last week!” Joe likes your work and suggests that you could sell these at the local Farmer’s Market. Sell my work? You’ve never thought of the idea. Pricing your turnings had yet to enter your mind. Your work really is priceless. It was made by you, with your own two hands. A baby rattle made by a Dad or Grandpa is really priceless. How can you put a value on a turning that was done for someone you love very much? What about that rolling pin that has been used almost daily since you turned it a few months ago? It’s destined to become a family heirloom. How do you go about valuing your work? If your turning stays a hobby then you will not be too concerned about pricing your turnings. But if one day you want to sell your work then you will have to consider pricing your work. I wasn’t joking when I said your work is priceless. It is made uniquely by you. That makes it very special. In fact that is your competitive edge in the market. Okay. Let’s make this a bit easier. You’ve gone into your shop and turned a beautiful bowl. What price should you charge for your work? One rule of thumb is 5 times the cost of materials. 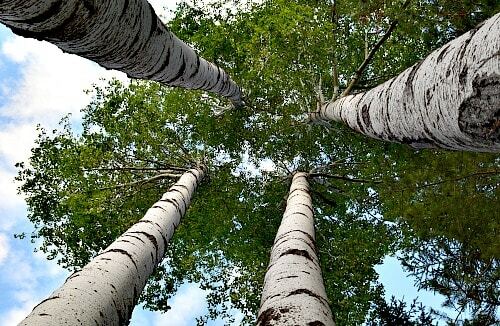 If you have found local wood then your cost is zero! 5 times zero is zero! Local wood may be free but not free in regards to your time and equipment. So what price should you charge? 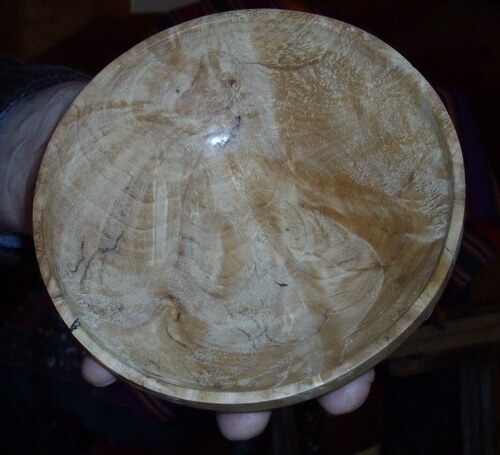 This is a bowl turned out of larch, literally rescued out of the fire because I started with a piece of firewood. So the cost was minimal. It can be very hard to estimate pricing based on the materials you are working with but you want to cover all the factors of your business. Pricing your product should provide for materials, time, overhead, and risk of being in business. This should include the rough cost of acquiring your wood. Purchase price, shipping, custom preparation costs and any incidental costs you have incurred are all part of the cost of materials. If you are adding embossing or other items to your turning include these costs as well. Consider the Bottle Stopper. This is a straightforward turning project. However you need to calculate the cost of all materials used. 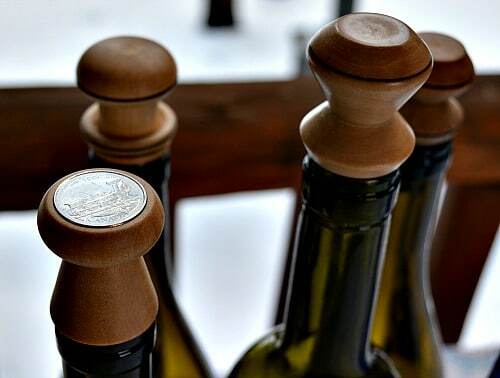 The size of the wood is fairly small but if it costs you $ 5.00 for a dogwood blank and you can get 5 bottle stoppers then your cost is $ 1.00 per stopper. The plastic inserts were about $ 0.25. The quarter is obvious. So the material cost would have been between $ 1.25 and $ 1.50. Your pricing needs to take this into consideration. If you have been turning for years then you have a pretty good idea how long it takes you to turn a medium sized bowl. Richard Raffan has a rule of thumb on turning bowls over 6” in diameter. Take the diameter times the height to calculate the amount of time it should take you to produce the bowl in minutes. Use this to calculate the time factor in your pricing. According to this formula the larch bowl above should have only taken me 20 minutes to turn! Remember that Richard has been wood turning for years. When you are just starting out you need to make allowances for learning the different cuts, how to attach the bowl to the lathe in different manners, and taking longer to achieve a good surface on the finished bowl. There is also efficiencies gained as you become proficient turning each product that you make. Honey dippers are a straight forward project where you are not doing much decoration. 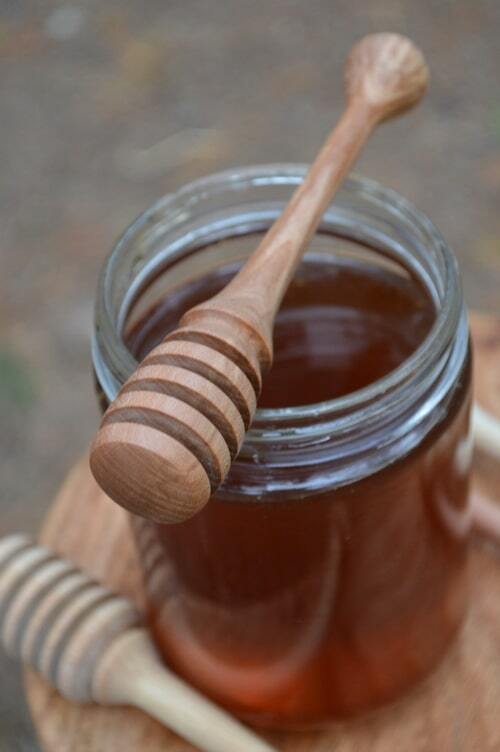 The first honey dipper that I turned took a good bit of time as I was thinking about dimensions and shape. After my fourth or fifth dipper it took much less time to turn. I knew what I was doing and I was warmed up with my tools as well. Production efficiencies are a great way to reduce the time it takes to make a product. Your pricing should reflect the benefit of some turning efficiency as you get more proficient. 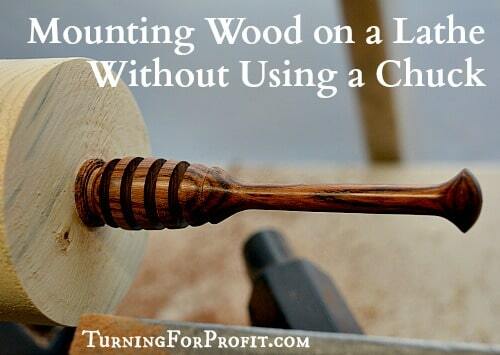 Make sure your time allowance is larger than your lathe or production time. Depending on your work processes you will need a time allocation for setup of equipment, preparation of the wood for turning and processing, finishing time and storage and handling. The nature of your products will affect this. Fine ceramic pottery requires greater care in storage than rustic turned bowls. Thin natural edge bowls would need individual packing rather than several in a box at once. If a product needs extra care and attention then your pricing should reflect that. You get to set the hourly rate for your time. Don’t undervalue yourself. This is the residual profit that rewards you for taking the effort to be an independent business owner. It’s what the shareholders receive for owning a limited company. If there isn’t any extra for you in doing your art then you are probably better off working for someone else. Of course the main reason you are doing this is because you enjoy your craft. If the return on your business is too low you will end up resenting the business side of your art and not enjoying the craft side of it at all. Keep the pricing on your products higher rather than lower. This will give you a better return for your time and effort and allow you to continue enjoying your turning. Not everyone will agree with you, but then not everyone is your customer either. Turn beautiful products and you will build up a loyal audience and following. These are the people you should focus on. You knew this one should have made the list. Well sales taxes are usually in addition to the price items mentioned above. Sales taxes depend on your circumstance and the provincial or state rules that apply. In Canada if you have sales of less than $30,000 then you do not have to charge the federal sales tax (GST or HST). BC has a sales tax on the sale of any tangible products. Whether the tax must be added on top of the price or included in the price depends on your jurisdiction’s rules. Remember that the price calculated to cover material, time, overhead, and risk of being in business, does not include sales taxes. Income taxes will come out of your risk of being in business area. So no, you don’t get to keep it all but if you are losing money then you won’t be paying any taxes. If you are making money than talking to your local professional accountant might be in order so that you save enough for the government. 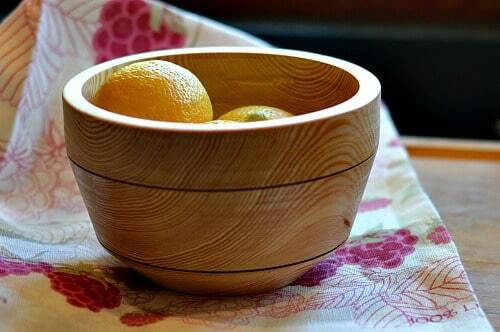 A small wooden bowl. What price to charge? Set a price that reflects a fair value of your work. Cheaper wooden items are available at the local thrift stores and mass produced for the box stores. 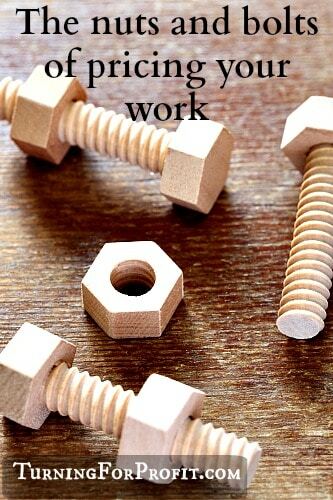 Your work is unique and produced by you. It has your artistic signature on it. You could be using unique local wood, or recycled wood. Sell your work and the story that made it. You will never satisfy those who shop the box stores. However the customers who know what you are doing, and value your craftsmanship, will willingly pay the real value of your work. In selling the fibre art for Joybilee Farm I spend a lot of time explaining the unique nature of our products and the materials used. Those customers who spend the most, usually understand what we do and don’t require the explanation. When it comes to artistic work, price is usually not the issue. Sell your work on its own merit. That is have a high level of quality control. Don’t produce junk. Smooth the bottom of your bowls and ensure each has a good finish and polish. In time you will learn the value and prices of your personal market. You might have to change your selling venue from a flea market to an art gallery in order for your art to be appreciated. Some craft fairs are not suited for high end artistic work. Your attitude while selling your work also influences the customer’s response. Have you any tips or techniques for valuing your work? What issues concerning the pricing of your art have caused you the greatest frustration? I knew what you were going to say but…. I was a furniture maker in California for 19 years and I have been turning here (Prague) for 13 years. There is a limit ro price. Yes, I can (and could) sell a few pieces for what I need but not enough to pay costs. Now at age 78 I no longer worry about it. It is my life, even end of life hobby. But for younger people there is a ceiling. The problem is compounded by the fact that few people have any experience with making. They don’t even cook. Many crafts people reduce overhead by moving to the country but this reduces exposure to new ideas, cultural currents and experiences not to mention your market. I have tried selling at craft fairs many times. People are looking for a bargain, and so I don’t sell many. I finally started selling at a local artisan shop. I had them originally set the price, based of their experience, and have been selling! Woo Hoo! It has given me the confidence that I needed in my work, as I am new and still make alot of mistakes, I am thinking that maybe I should raise the prices gradually, to find my “sweet spot”. What do you think? Finding the right place to sell your products is crucial. You need to monitor how your sales are in each venue. Definitely raise your prices! 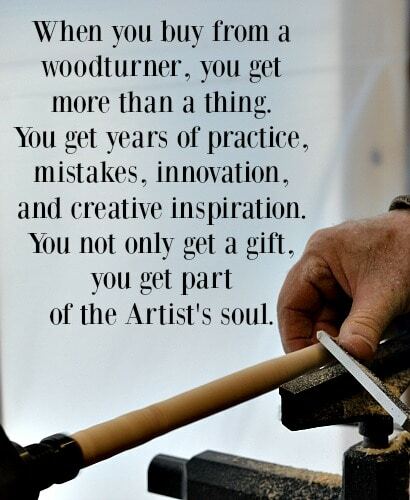 Seriously most woodturners / artisans struggle determining a good price. Glad the switch works for you! I have found that your two criteria are impossible in my market where the great majority of people sneer at crafts made of wood unless they are pepper mills or cutting boards. Etsy is very little better. I use a simple formula for bowls then adjust up or down from there. Diameter times height times two. Is it is exotic wood or has inlays I go up alittle from there. If it happens to be a small bowl I might go down alittle. The formula gives me a good base price.